Longtime test kitchen assistant David McCann puts the red-hot appliance through its paces. 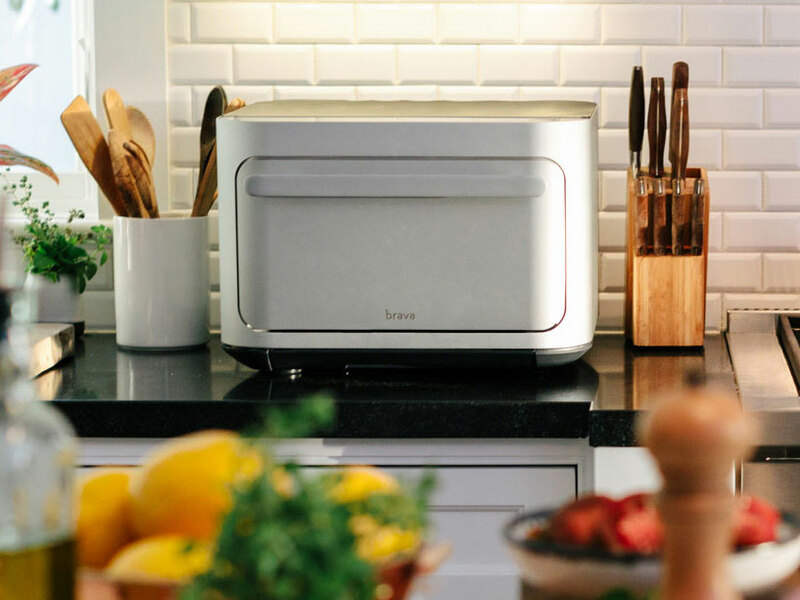 We frequently try out new products in the Food & Wine Test Kitchen and I admit to some skepticism when we were presented with a new, countertop-sized oven called the Brava. Not a toaster oven, not a microwave, this wonder oven promised to cook things with light. It also promised the ability to cook, for example, salmon fillets, new potatoes, and green beans to the perfect stage of doneness at the same time. Needless to say, I was not convinced—until the developers and their chefs made creamy potatoes, crisp-tender beans, and rare salmon with shattering skin right before our eyes. I was gobsmacked, verging on obsessed, but our team needed to try it out on our own. We agreed to try out the meal kits, available from the Brava marketplace, but also planned some more tests with ingredients we bought at the store. As is the case with most obsessions, the Brava turned out to be both as wonderful as I first thought, and also not quite in some ways. During the demonstration, the Brava team placed a row of salmon fillets skin-side-down on the glass insert, then another row of small potatoes, and a last one of green beans. The insert slid easily into the oven, then the team closed the door and programmed the machine for those specific ingredients. Minutes later, they served us the aforementioned foods, along with soft cooked eggs, crispy toast, and a berry compote augmented with yogurt and granola. All in all, it was amazing. To be fair, this food came in one of their meal kits, so everything was exactly the right (and same) size. We tried some of the meal kits sent to us and it was pretty good. But would real world ingredients, with differences in size and shape be as astonishing? And, as a 63-year-old who is not a total Luddite, but is moderately tech challenged, would I be able to use the Brava with the same ease and success as the Brava team? I started with something seemingly easy. I cracked two eggs into the egg plate, slid that in the directed slot, and set the Brava for fried eggs. So far so good. Three minutes and 15 seconds later, I opened the Brava, easily slid the eggs onto a plate, added a pinch of salt and pepper, and a bit of butter and tasted. 95% of the white was cooked—a bit too firm and rubbery for me. The yolk was about 90% perfectly runny, with a bit of hard-cooked yellow on the edges, and a gelatinous slick of undercooked white on top. Was I being too picky? Eggs are notoriously fickle. We tried it again, and the results were the same. We moved on to scrambled eggs—a wrong move, as it turned out, yielding dark brown footballs with raw centers. We moved on, starting with a non-pre-programmed pairing of boneless chicken breast with small potatoes. There was an existing program for boneless breasts and fingerlings, which is close, but not the same. This is one of the difficulties we found with this generation of the Brava. It’s not easy to set the oven unless you are using the exact foods in one of the pre-programmed groups, hence the meal kits. But we followed the directions as best we could, including inserting a temperature probe that’s difficult to manage, especially when you have to pull the hot probe out of hot meat at an odd angle because the wire is way too short. The chicken was well-cooked, and not too dry, however the top of the breast was leathery and overcooked. Maybe I measured the breast incorrectly. Perhaps time and familiarity would negate that problem. The potatoes were lovely and creamy inside and like leather outside. Again, maybe with time and usage (and the actual fingerlings) we could circumvent this problem. Next we tried a salmon fillet, solo. It was perfect. In the end, I’m a bit stuck. I love the idea of the technology, I really love some of the results, and practice would allow me to get better at using it. But I’m a bit unsure about the target audience. If it’s folks like me, 60-plus and cooking for one or two people, then the interface needs to be much simpler and more flexible. If it’s younger folks, then I wonder about the cost. It’s not cheap, especially if you add in the meal kits. Allow me to leave you with a list. I assume that the developers are addressing many of our concerns already, and only time will tell. David McCann has worked as an assistant in the Food & Wine Test Kitchen since 1983. Find more from David at thisoldchef.com.